It’s not often they make ‘em like this any more. More hops. More booze. More sweet. More sour. That’s what the people want, they say. It’s all about having something fresh, something new, they say – the planned obsolesce of the beer world putting the classics out of fashion. But some things will never be out of style. A solid stout is one of them. 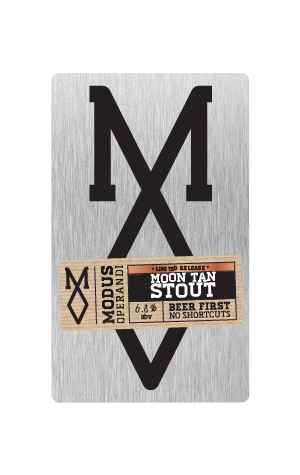 Modus Operandi found the imperative to make one for BrewCon 2018, the beer conference being held in their home city of Sydney. They got talking trade with the Kiwis at Gladfield Malt and they officially teamed up, the maltster throwing the brewer a few sacks of a new specialty malt called Eclipse Wheat. Playing on the name and the timing of the release, the Winter Solstice, they called the beer Moon Tan. This is a beer that’s beyond black. It’s impenetrable – a soul-absorbing darkness. It doesn’t feel strong, though it’s stronger than you think. That’s matched with flavour that represents gentle intensity: a deep, dry roast character – loads of it – that’s rich and nourishing. It’s the proverbial meal in a glass, like a good stout should be. You could write a thousand words about Moon Tan and it still wouldn’t make it sound especially interesting. Pity, as it’s a beauty.